There is a story unfolding on the Drum Corps International Tour. It's about a competition between brass lines – a ladies vs. guys duel. It's Mandarins' all-female trumpets, aptly called "Boy Killers," going up against the all-male "Girl Crushers." And the showdown between these groups and many others will be this Sunday, July 24 in San Antonio, Texas during DCI's World Class Individual & Ensemble Competition (I&E). From 10 a.m. to 2 p.m., more than 300 performers from DCI's finest will step out to display their talent, techniques, and unique performances at San Antonio's Historic Sunset Station (1174 E. Commerce), just a stone's throw away from the Alamodome. New this year? A medal ceremony starting at 1:30 p.m. that will immediately recognize the winners. If you have never been to I&E or haven't been in a while, now is your chance to see something akin to America's Got Talent – without a Hoff or Howie. What you may be seeing is a future drum corps celebrity on the road to discovery. The performances are as varied as the individuals. And it is in those differences we can see the glimmer of greatness stretch from the field to the stage – a peek under the shako. Yet, "different" is relative. Someone's rudimentary snare licks can be a thrill to percussionists or a yawner to the uneducated. These days I&E performances can be clever, funny, poignant, but always amazing. Some I&E moments have reached near perfection; some actually did. It's a box of chocolates, unknown until tasted, enticing and unique. I&E moments that are still talked about today are remembered not because of perfection in technique or score, but rather showmanship. Here are but a fraction of the thousands of I&E performances over the years that have caught my attention through talent and what Simon Cowell calls, the "X" factor. It's just a hint of what you could see this Sunday in San Antonio! In 1998, Madison Scouts color guard member Todd Ditchendorf competed and won the Auxiliary category using a drum major mace, an atypical but completely legal apparatus. The next year there was a buzz too great to pass up – he was going to defend his crown but with a twist. Imagine the gasps when he began spinning two maces at the same time to near perfection. Todd, who now works as a software engineer in the Silicon Valley, explains how the idea came about: "I was drum major of the 320-piece marching band at my university (USM) where mace spinning was a long-standing tradition. Mace spinning was actually my gateway to color guard and drum corps in general. So when marching with the Madison Scouts, I figured why not perform one of my old drum major/mace routines for I&E? It turned out to be blast, and I was glad to introduce people to a type of spinning they maybe hadn't seen before." This show, titled "A Latin Tragedy," is legendary in the world of percussion. The six-man ensemble performed more "tricks" in a single performance than most corps do in a single 15-minute show – practically a crime! 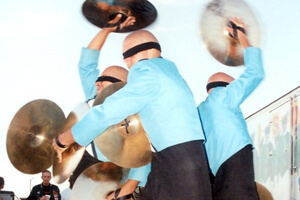 2004 Spirit Cymbal Caption Head Eddie Capps explained how it came together: "The main four guys were Obed Resendez, Colin Choat, Mario Taylor and Drew Johannessen. Then we had a snare drummer named Elanders Frazier and a bass drummer named Nigel Conton. These guys were great. "We woke up an hour before the corps everyday during tour to work on our I&E performance and even worked on it on laundry days. Before our performance, we only got there in time to run it once and Colin got his finger smashed in the blindfolded section. Unfortunately, there was blood everywhere! It was awesome that people who were watching us all went crazy for him. "The blindfolded section that we performed was from what we used the year before – we just beefed it up a bit. Most people didn't even realize that the guys pulled the headbands over their eyes which if they did they would have appreciated it even more. We started that in 2003 and people are still using it every year in WGI! That and the 'meat grinder' section where they face into each other and do the big windmills hitting each others' cymbals in the center. These guys were an absolute pleasure to teach, and I haven't had a line that dedicated since then." One man and 18 drums! That's what the Blue Devils' Tim Jackson faced when ending his illustrious DCI I&E career. He spent hours cranking the drum heads to perfection, tuning them like timpani to perform the "Theme from The Godfather" on three sets of tenor drums. The result was worth the effort, and pure magic. Tim is probably one of the few who has won four consecutive DCI I&E titles which he achieved from 2003 to 2006. If tenors are typically the craftsmen of the battery, intense and wired for beats, then Jackson was, and still is, truly the master of his craft. These days, he continues to stay active with a myriad of creative projects including instructor/designer with the Bluecoats. In 2006, Jennifer Russell entered the Dance category and won with a near perfect score of 99. In 2007, she returned and won again with an unheard of 99.5. The twist on this story is that Jennifer was not a color guard member, rather a trumpet player in the Boston Crusaders' brass line. Today, Jennifer continues her dancing career from Broadway to TV as a performer and choreographer. This one was too fun to pass up for my "Top 5" list so here it is as a bonus clip! Granted this mixed ensemble included a few ladies, but the screams of delight were probably focused on the gentlemen. Be sure to check out their amazing feats of strength! Just a reminder that Sunday's Indivdiual & Ensemble Competition in San Antonio, which is free and open to the public, will feature vocal categories for the first time – soloists and ensembles. Is there a true American Idol winner in the mix? Come join the festivities to find out! Learn more about the I&E Competition.